The Gallery of Cosmetic Surgery, founded by Board Certified Facial Plastic and Reconstructive Surgeon Dr. Kevin Sadati, announces a new treatment option called Microneedling. This innovative treatment minimizes fine lines and deep wrinkles, and improves volume loss, acne scars, stretch marks, and uneven skin tone. Skin rejuvenation with very little down time! Results are almost immediate, with patients noticing an immediate glow. 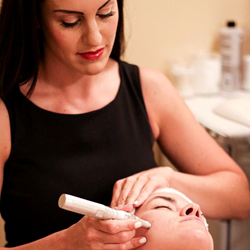 Microneedling is a rejuvenation procedure that creates tiny, evenly-spaced, minimally-invasive punctures that stimulate the body’s natural collagen production. As the body produces copious amounts of collagen to address the micro-injury incurred, skin concerns are naturally corrected. Additionally, when PRP therapy is utilized (the body’s own platelets are infused) the results are exponentially amplified. This rejuvenation procedure is also an exceptional pre and postoperative neck and facial-procedure treatment. the body produces copious amounts of collagen to address the micro-injury incurred, skin concerns are naturally corrected. Additionally, this technology is used for our very effective PRP Hair Restoration Treatment. Our staff are highly trained and experienced in advanced medical aesthetics. When performing skin rejuvenation procedures, we take time to consult with each patient, using our expertise and an artistic touch to ensure each patient has a results-oriented and custom-tailored plan in place. How long does it take? In a single motion, the pen is gently held against the skin while it is simultaneously guided in one direction, covering the entire treatment area. The procedure takes about 15-30 minutes, depending on the size of the area treated. While pain and discomfort are none to minimal, a topical numbing cream can be used to make the patient comfortable. Results are almost immediate, with many patients noticing an immediate “glow” to their skin. Visible changes to the skin will continue to appear over the next few weeks. Results can even continue to improve for up to six months after the treatment. So, how many treatments are required? Dr Sadati says that, “Most patients receive a series of anywhere from 4-12 treatments at 3 to 4 weeks apart for optimal results.” Patients interested in a way to restore hair growth, minimize fine lines, deep wrinkles, volume loss, acne scars, stretch marks, and uneven skin tone and discolorations with microneedling should contact the Gallery of Cosmetic Surgery for more information. Dr. Kevin Sadati is a highly specialized and experienced facial plastic surgeon in Orange County, CA. He is a Board Certified Facial Plastic and Reconstructive Surgeon and Otolaryngology/Head and Neck Surgeon. Dr. Sadati is highly respected by his peers and patients for his demonstrated skill and expertise in his field.